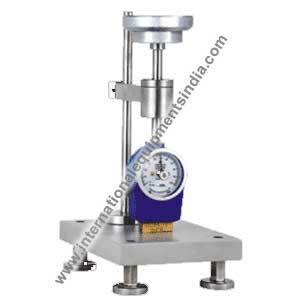 “Hardness tester” offered by International Equipments is to check hardness of hard material like Plastics using Shore D hardness tester and soft materials Rubber using Shore A hardness tester. Operationally the product comes with a Dial gauge for display of results and an indenter that is pressed against the surface of respective material to check hardness. SELF LOADING DRUM is a unique feature that in built in with this hardness tester. It is very essential since constant force application at all times is essential for delivering repeatable value at all times.